LTHForum.com - Cuisinart ice cream maker-- should I? 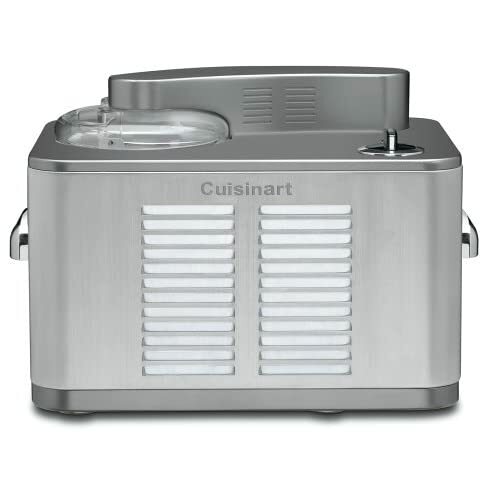 Cuisinart ice cream maker-- should I? LTH Home > Chat > Shopping & Cooking > Cuisinart ice cream maker-- should I? Costco has a Cuisinart ice cream maker, this model or something close to it, for $50. Should I? Is there something better in a similar price range? Do I need to add ice cream making to my motley skill set? Will my family be delighted when I make basil ice cream like Alinea or Scylla? I say, no, you shouldn't. There is no need for a big electric appliance here. Get a Donvier. Freeze the container and give the thing a crank every few minutes for 20 minutes and you've got a quart of ice cream. No plugs, no muss, no fuss. Yes, it's an excellent ice cream maker, and the effort required to make the base means you really want to be freezing 2 quarts at a time, and not 1. You've got the space to store the canister, you've got the space to store the electrical parts, I wouldn't worry so much about that. And once you start making your own, you'll really stop buying it from stores, and maybe even Scooter's. Alton Brown's custard base recipe is a very good starting point. There is no need for a big electric appliance here. Get a Donvier. But it's $50 too. And it's not as shiny. I love mine. Summer is sorbet time, man....blood orange, blueberry, fresh michigan raspberries....peaches! Just keep the base in the fridge and you're good to go anytime. Well worth the cashola and i've had mine for 4 years and it's still stellar. Cookie wants to get this thing that attaches to the Kitchen Aid mixer. I like my 'wants' cheap ... I bought a Donvier with all parts and the recipe book for $2 last year at a rummage sale. I could be on the look-out for you, if you desire this. We have a similar model and use it quite frequently, so I say go ahead and buy it. It's pretty idiot proof and generally turns out a good product. BTW before the electric version I had the hand crank kind and hated it. I think the regular agitiation produced by the electric model produces a much smoother product with a lot less crystallization/chunkiness. Is it fun to have an ice cream maker? Yes. Ice cream bases are easy enough to make, and it's pretty nice to sit down to a nice bowl of homemade ice cream. Only thing that keeps me from using mine more (older Cuisinart version of a couple years ago) is that whole "instant gratification" thing. An ice cream maker only gets it mostly frozen, it still needs a couple more hours in the freezer. And I rarely plan ahead. If I was crunched on space to store mine, I'd be all over the Kitchen Aid attachment. Although the bigger Kitchen Aid thing looks like it takes up a LOT more space in the freezer. And if you do buy one... look in to buying an extra canister. Totally worth it. Last edited by missvjw on April 25th, 2007, 9:55 pm, edited 1 time in total. eatchicago wrote: Cookie wants to get this thing that attaches to the Kitchen Aid mixer. Wow. That's the opposite of cheap. At least, it looks like the going rate for these Cuisinart things is about $50 -- not just at Costco. Amazon's price is $75, discounted from $100. Unless you know of some reason the thing is mechanically better, I don't know why you'd pay more. You still have the same kind of thing you need to store in the freezer, the capacity is the same (2 qts). The only reason I can think of is if you really don't have space for the cuisinart base in your kitchen because that space is being taken up by the more versatile mixer. I am sure in some small spaces, $25 is a fair trade off for less clutter. I have had the cuisinart for a couple of years. I tapered off dramatically after making a lot of ice cream in the first year, but then, I'm also much lazier in the kitchen than most of you. It does show it's low price point, in that I think the canister thaws a little too quickly, making it hard to get ice cream as thick as I got with my short lived* Rival ice-and-rock-salt device. You can still make good ice cream, but I always felt it was falling a little short, especially when I wanted to mix in stuff. Mike G, I think you'll find it fifty bucks well spent. I bet the kids will love it too. You can make some really basic mix-only (no cooking) bases that are super easy**, although I think those recipes are the ones that are subject to the dreaded "fat pockets" phenomenon when your home made ice cream doesn't get eaten quickly enough. But if you need help finishing it off before that phase strikes, I am but a PM away. **My favorite easy recipe was a garam masala ice cream I made which was dead simple. Basically just the Ben & Jerry's sweet cream base (some milk, some heavy cream, some sugar, and an 2 eggs, stirred together) plus a teaspoon or so of garam masala powder. From time to time the powdery nature of the spice came through the texture in a way I didn't love, but it was so so simple that it didn't really bother me. I made this several times as cinnamon ice cream before trying GM instead. It works very well - the advantage is it has a built-in freezer - you don't have to plan ahead to put a large bowl in your freezer. Disadvantages - it's about 3x the cost of the model you saw at Costco, and it takes up a lot of counter and/or cupboard space. In the tradeoff of freezer space vs. counter space, the freezer won, and the counter has to live with this guy. I had a Donvier for a while (in fact, it's still probably down in my basement somewhere), and I found it made a much grainier/sandier ice cream than other ice cream makers with electric motors for continuous churning. Oh, that is a seriously good price, even if it's a refurb. I've had this beast on my wish list for ages, staring at me.. but at 1/4 the price, that cuisinart is seriously tempting. I read the description of the Donvier and clicked through to see a photo of this hybrid wonder. To my suprise and delight it is the same machine (or type thereof) that we used growing up for countless quarts of icecreamy and icemilky goodness. That machine met its demise during a cross country move. For the past few years, I have been looking for one of these in resale shops and garage sales assuming they were no longer made. I couldn't recall what they were even named. If this season's tag sales don't produce fruit then I might cave in and get one off online. Cathy2, if you see one I would be happy to reimburse you. If space is a consideration, the hybrid occasional crank-freezable container verson is great. You might not get as fully smooth of a product but the results are pretty good. I have this comparable model from Cuisinart and I love it. Yes, you have to store the canister in the freezer, but wrapped in a clean plastic bag (I use the one it came in) and it's ready to go anytime. After making and cooling the custard base, I let my churn for about 25 minutes and I get a near-perfect consistency ready for the freeze. (Because it is electric, I can do something else during this time and forget about it for 25 minutes.) I'm sure there are better units on the market, but at $50, it's relatively low risk. gleam wrote: Oh, that is a seriously good price, even if it's a refurb. I've had this beast on my wish list for ages, staring at me.. but at 1/4 the price, that cuisinart is seriously tempting. I have also had the Musso 4080 on my wish list for a few years. A friend owns one and always turns out the richest, creamiest, smoothest, most awesome ice cream. I've owned a Donvier for about 20 years and it does a fine job, but there is no comparison. I think this is one of those cases of getting what you pay for. I've held off getting one because my weight would likely double within the first month. There is an earlier thread on ice cream machines. It may have been Bob S, but somewhere someone talked about the pluses of the Donvier manual system when making sherberts, granitas. The automatic machines don't provide the result desired because they over-processed the product. I cannot find the explanation readily, though I know it is here somewhere! The reason the automatic ones won't work for granita is that you want a grainy texture there, not smooth. But you can just as easily make granita in your freezer by putting it in a tray and scraping it up with a fork every now and then until you get the texture you desire. As for sherberts, I've always treated that as a synonym for sorbet? In which case, I very much like a smooth texture in my sorbets, so I don't see the advantage of the hand crank. gleam wrote: As for sherberts, I've always treated that as a synonym for sorbet? Usually, I think sorbet is basically a frozen fruit puree, maybe with added sugar or acid. Sherberts (or sherbets) usually have a little more stuff in them, most frequently milk, or sometimes egg whites and/or gelatin. But I agree completely with your granita-making method. It probably could be made in a Donvier, but it would be tough to get the iciness that you get from the scrape-the-tray-in-the-freezer-with-a-fork-from-time-to-time method. Cathy2 wrote: I like my 'wants' cheap ... I bought a Donvier with all parts and the recipe book for $2 last year at a rummage sale. I could be on the look-out for you, if you desire this. I, also, lucked into a Donvier in this manner (I think I got it at the Brown Elephant, a good place to look for one)- even though it was missing parts. However, if you contact the manufacturer, most of the parts esp. the small ones, are available dirt cheap. I think I was out $8 for mine, so Cathy wins. I had a Donvier 17 years ago and loved it. OK, actually it belonged to my girlfriend at the time, which is why I don't still have it. Made a lot of good sorbet and some OK ice cream, although somehow always seemed a bit icy/crystalline. Maybe didn't have the freezer cold enough? Growing up, we had a manual-cranked, oaken tub, rock salt and ice charged ice cream maker. My mom was willing to use it once a year (4th of July), for which she made a cooked custard base that I can still taste 30+ years out. * Mind you, the woman lives alone and eats like a bird. I have a certain sympathy for the idea that if you want to make something right, you buy the right equipment, and I was starting to work my way up the scale (did we ever decide if May Street Market has a Pacojet?) when I decided, screw it, $50 is a good price to see how well you like doing something, so I'm freezing the bowl on my new Costco Cuisinart ice cream maker and contemplating flavor possibilities right now. I recently made creme fraiche ice cream to accompany a dense bittersweet chocolate cake. People liked it. A lot. I found a pint-sized Donvier at a rummage sale this morning for $1. in the original box with the instruction manual. Mike G wrote: I'm freezing the bowl on my new Costco Cuisinart ice cream maker and contemplating flavor possibilities right now. He garnished it with Mexican-style granola. 1) More ice crystal-y than creamy. How do you get it to be creamy? 2) There's a weird mouthfeel thing after you eat it, like the inside of your mouth has been coated with Pam or something. This is weird because it couldn't be more natural-- heavy cream, milk, egg yolks, sugar, strawberries. One thing-- after I made the base, I read that you really don't want the custard to go above 180F, and I had it right around 200F. Maybe I broke the custard, though it didn't curdle. I don't know, anyway, it's less than entirely appealing. What up? What quantities of all of the ingredients did you use? And 200F definitely sounds high to me. I would also, personally, start with a basic vanilla or chocolate custard, get that down pat, and then move on to more exotic flavors. I saw a Donvier at the Brown Elephant on Halsted on Friday. It was in the cookwares/appliances section on the south wall, at eye level, sort of pushed to the back of the shelf. Didn't buy it...my Cuisinart is sitting unused, mainly because I have no room for the freezer bowl in my freezer. BTW, when I was a teen, we had a pint-sized Donvier. I don't see it featured on Donvier's website, but it does seem as if they're still available on eBay. That was a useful little machine...easy for making frozen yogurt and other small-batch items. Hmm...maybe I'll buy one. The ice crystals vs. smooth and creamy might be a "time to frozen" issue. The longer it takes to freeze the base, the more ice crystals you'll typically have present. Which, I suspect, is why the ice cream that you scrape off of the canister wall when you're finished is so smooth. I usually let the base sit overnight in the fridge for eight hours to cool and to let the flavours blend. I also try to keep the the base from getting much higher than 170F, but I'm not sure that will make as much of a difference. Also, everybody seems to forget about the fringe benefit of the ice cream maker: on demand slushies and various frozen mixed beverages. At those temperatures, I doubt the temp of the base made much difference - assuming it was well chilled before going into the very well frozen - back of the freezer - ice cream freezer bowl. Sounds like you had enough fat in there to make it creamy - was it well-churned? One option would be to whip the base in a Kitchenaid with a whisk or some such thing to get the overrun up and lighten everything before putting it into the freezer (you could even melt it down, whip it, and try freezing again). No other ideas about the oily mouthfeel, but that's a start.